I’m continuing my posts on how to self-publish with some thoughts about how an author should work with an editor. 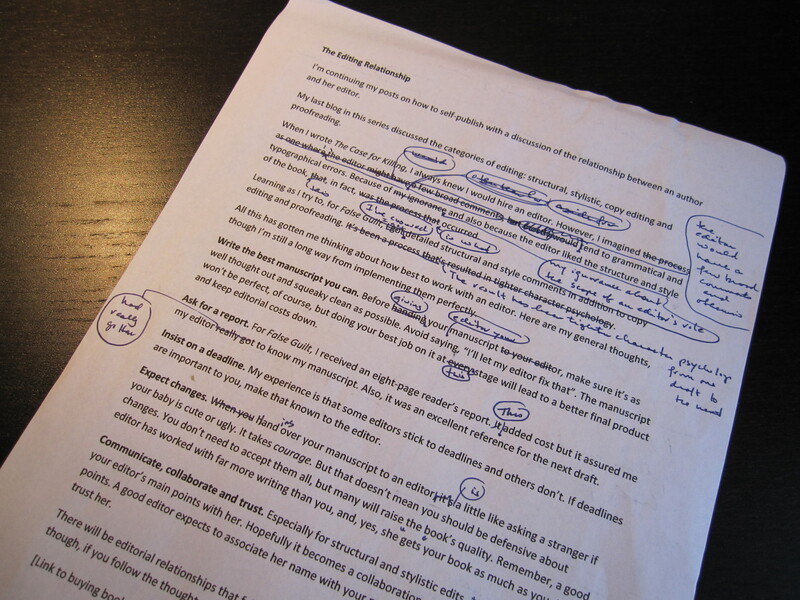 My last blog in this series discussed the categories of editing: structural, stylistic, copy editing and proofreading. When I wrote The Case for Killing, I always knew I would hire an editor. However, I imagined the editor would have a few broad comments and, otherwise, fix grammatical and typographical errors. Because of my ignorance about the scope of an editor’s role and because the editor liked the structure and style of the book, that, in fact, is what occurred. Learning as I try to, for False Guilt, I received detailed structural and style comments and then turned another draft (it’s in for copy editing now). The result has been tighter character psychology. All this has gotten me thinking about how best to work with an editor. Here are my general thoughts, though I’m still a long way from implementing them perfectly. Give your editor a quality manuscript. Work hard on the structure, style and language of your manuscript before asking for your editor’s input. Avoid saying, “I’ll let my editor fix that”. The manuscript won’t be close to perfect, but giving your editor a high quality draft will lead to a better final product and keep editorial costs down. Ask for a report. For False Guilt, I received an eight-page reader’s report. This added cost, but it assured me my editor had really gotten to know my manuscript. Also, it was an excellent reference for the next draft. Insist on a deadline. My experience is that some editors stick to deadlines and others don’t. If deadlines are important to you, make that known to the editor. Expect changes. Handing over your manuscript to an editor is a little like asking a stranger how good-looking your baby is: it takes courage. But that doesn’t mean you should be defensive about changes. A good editor likely has worked with far more writing than you and most of her changes are bound to raise the book’s quality. Also, in the end, it’s your book and you don’t need to accept every change. Communicate, collaborate and trust. Discuss your editor’s structural and stylistic edits with her. Hopefully it becomes a collaboration and not a contest about scoring points. A good editor expects to associate her name with your project, and for that reason, you should trust her. There will be editorial relationships that fall apart under the strain of diverging visions. Generally, though, if you follow the thoughts above, I think you’ll get a much improved manuscript. Good one, again. What about another approach to the same topic, with advice from your, and perhaps other, editors. What do they say they want?